In electrical talk an outlet is lights, switches, smoke detectors and receptacles. However, many recognize the term outlet as a place to plug in a lamp or another electrical device. I will use the term outlet as such. An outlet is an opening that allows the extension of an electrical circuit. Every time a device is plugged into an outlet, whether temporary or long term the circuit is extended. Light switches are a gateway for electrical current. Oddly enough, a closed gate allows the passage of electrical current, while an open gate prevents the passage of electrical current. The normal use of outlets and switches (overtime) will cause the mounting hardware to become loose. This continuous movement wreaks havoc on the electrical connections. The electrical wire (branch circuit) is made of solid copper and the constant movement will break down the wire and eventually lead to a broken electrical wire. Additionally, this movement works on the connections causing them to become loose as well. These loose connections lead to heat, which can lead to an electrical spark, spontaneous combustion and a fire. This photograph can be the end result of loose outlets and switches. However, the end result can be more disastrous and lead to an electrical fire. 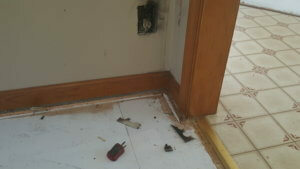 The repair is simple, remove the cover and tighten the mounting screws for the outlet or light switch. Make this a semi-annual task as part of your home maintenance routine. Do it now! It only takes 10 minutes to check the outlets and switches in your home, tightening as you go may lead to an hour, but I know your family and property are worth that hour.